Dean Rice is giving mouth-to-mouth to a California condor. Three assistants prop up the nearly 20-pound bird as the veterinarian puts his lips on a tube protruding from the beak. Bird 134 is motionless, his eyes turned back inside his head. Lead poisoning, the leading killer of condors, is close to claiming another victim. Biologists have known for decades that lead sickens condors, bald eagles and other birds that swallow bullet fragments left inside animal carcasses. Hunting waterfowl with lead shot has been illegal since 1991, but the heavy metal remains the ammo of choice for shooting game and upland birds. Wildlife advocates are working to change that. Pressured by a lawsuit, the California Fish and Game Department has proposed a ban on hunting with lead ammo in condor country. In Arizona, state and federal officials have adopted a softer approach, focusing on hunter education and coupons for unleaded bullets. Biologists agree that if the lead problem isn’t solved, the condor population — now approaching 300 in zoos and the wild after falling as low as 22 in 1982 — may never become self-sustaining. Until he was poisoned, 134 exemplified the progress of the condor recovery program, a $40 million flagship for the Endangered Species Act. Released in 1998 as a 2-year-old, 134 glided above northern Arizona on wings nearly 10 feet wide. He quickly learned to locate the remains of big game and weaned himself off the stillborn calves that biologists dole out to provide birds lead-free meals. “He was a perfect example of the fact that they don’t need us all that much,” says Thom Lord of the Peregrine Fund, the nonprofit group that releases the Arizona birds and manages them on a daily basis. In January 2006, Lord and his colleagues lost track of Bird 134. His prospective mate had already been poisoned and was in captivity receiving chelation — painful injections of a chemical that binds to lead and ferries it out of the body. Somewhere in the Grand Canyon, 134 was grappling with the toxic metal on his own. The only real option for rescue was a helicopter ride out. “It seems like a lot to do for an individual bird,” Lord says, “but if you imagine how many resources have been invested in each of these birds, they’re all certainly worth that, if not more.” Lord climbed out of the canyon the same day. The next morning, he and a colleague boarded a Park Service helicopter and retrieved the bird. Three hours and one plane flight later, 134 was in a cage at the Phoenix Zoo. Lead has poisoned at least 59 types of nonaquatic birds, including hawks and eagles, which pluck bullet fragments from carrion like condors do. Quail, grouse and other ground birds also swallow lead pellets when they pick up grit for their gizzards. Condors may be predisposed to lead poisoning because they don’t cough up pellets of indigestible material as often as other raptors. A spate of lead poisonings in the mid-1980s helped spur the U.S. 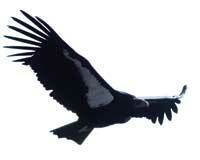 Fish and Wildlife Service to capture the world’s remaining wild condors. A breeding program in zoos has since bolstered the species’ numbers, but the condor’s glacial reproductive rate makes the species vulnerable. Lead poisoning also raises the prospect of a sudden catastrophe. On several occasions, multiple birds have been sickened by scavenging the same tainted carcass. Since 1992, at least 18 condor deaths have been attributed to lead, including three birds recovered in Arizona in 2007. Other condors that succumbed to predators or power lines may have done so because sub-lethal doses of lead impaired their eyesight, flying skills or mental abilities. Condor 134 couldn’t even stand up when he arrived in Phoenix. Blood tests revealed the most severe case of lead poisoning veterinarian Kathy Orr had ever seen. The lead had paralyzed his digestive tract: The bird was starving to death. Orr and her colleagues surgically inserted a feeding tube into 134’s stomach and used Metamucil to flush his system. Still, 134 was dangerously anemic. They had to find condor blood for a transfusion. Orr showed me two X-ray images that summed up the problem. The first one depicted the spine of a deer that had been shot with a .270 Winchester rifle. 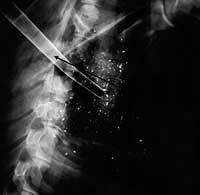 Dozens of brilliant white specks of lead were sprinkled among the beige-colored vertebrae and the surrounding dark tissue. Lead bullets often explode upon impact. In a 2006 study of deer shot with a variety of bullets, Peregrine Fund researchers found an average of 160 shards of lead, many barely visible, some nearly six inches from the wound channel. The second X-ray showed a condor’s digestive tract. At first, I couldn’t see the lead’s bright signature. Orr used a pen to point out a piece smaller than a grain of rice. “You’ve got this big, magnificent bird — one of 273 in the whole world — and this little piece is all it takes,” she said.